A hand-woven pattern using a flat bamboo strand... hence the term "caning". A six layer pattern with a seventh step binder attached around the perimter holes with loop tie-downs. The many ends of the cane under the seat are then wrapped as shown below. Similar in appearance to "thru-the-hole", but in reality a pre-made "mat" attached into a groove around the perimeter of the hole with glue and a pressed-in spline. Notice there is no tie-down loops on the binder "spline", and, likewise there is no appearance of cane on the back or under side of the frame. Another flat bamboo cane weave, Over-the-round or Primitive caning can be done in either a Herringbone or Porch Rocker woven pattern. A two layer process weaving the top and bottom (or front and back) of the frame simultaneously whereby the cane wraps around the frame or "rounds". Similar to "Over-the-round", but using wide fibre splint or natural oak, ashe, or hickory splint. A common weave found on those rocking chairs at your favorite Florida native restaurant... or on ladder-back dining chair, as shown below. Rush was originally done using rolled cat tail leaves. Although natural materials are still available (though quite expensive), less expensive, man-made fibre rush material is most often used. 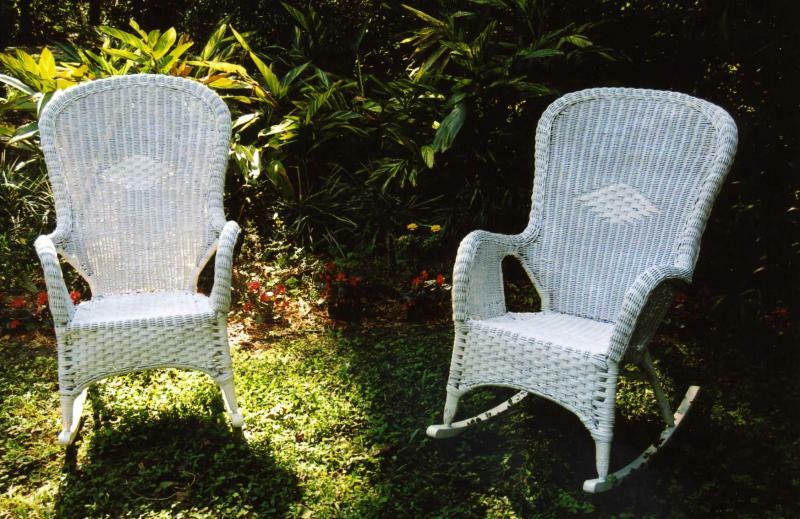 Wicker, a round water reed woven into elaborate chair patterns. Repair or restoration available upon request.